However, just because the Doritos ads were very popular on social media, it doesn't mean the chatter was all positive. While Peyton Manning and the Denver Broncos hoisted the Lombardi Trophy Sunday night, many advertisers celebrated big wins after the Super Bowl, too. According to Salesforce, Doritos and Budweiser were the most-talked-about Super Bowl advertisers on social. Salesforce data shows that Doritos, with its #CrashTheSuperBowl hashtag, was responsible for 33.5 percent of the Super Bowl ad discussion. 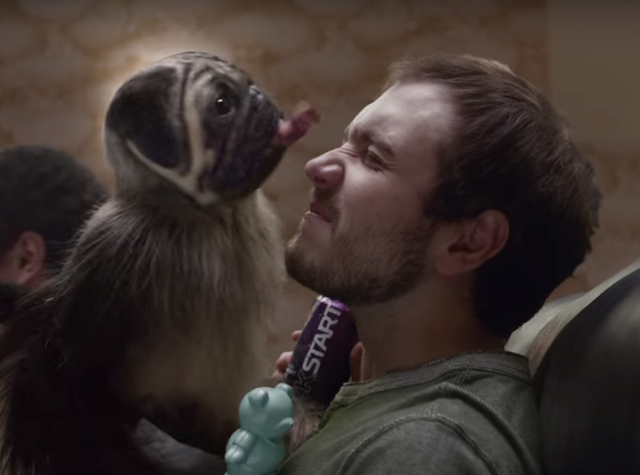 Mountain Dew also won big with its weird #PuppyMonkeyBaby commercial early in the game. According to Brandwatch, the largest peak in any hashtag mentions was #PuppyMonkeyBaby, which generated nearly 4,000 mentions in the one-minute during and after the ad. All together, PepsiCo seemed to be the big winner during this year’s Super Bowl, across both their beverages and snacks brands. As always, their #CrashTheSuperbowl campaign for Doritos, where everyday consumers create their own Doritos ads for the Super Bowl, delivered two of the top-trenders: #DoritosDogs and the hilarious “sonogram” ad. And what can I say about #PuppyBabyMonkey? Aside from Mountain Dew trending on social media, it is the #1 most talked about ad in the Adaptly office this morning! The big lesson here is, most of the top-trending advertisers supplemented their campaigns with paid social, and did not just rely on organic (non-paid) social to create engagement during the live event. By boosting their content with paid social media they greatly amplified their TV investments, far beyond what they could have achieved through simple organic social posting. I would expect these brands to take a similar approach to future live events, and we are already seeing these strategies come together for the upcoming Academy Awards. However, just because the Doritos ads were very popular on social media, it doesn’t mean the chatter was all positive. One ad, featuring a baby leaping out the mother’s womb to retrieve a thrown Doritos chip, sparked a debate on social about abortion. Data from both Digimind and Brandwatch show that viewers reacted very negatively to Doritos on social. Digimind showed that Doritos led the way in terms of negative sentiment, with 34 percent. Brandwatch data takes it even further, showing that 69 percent of the Twitter mentions tracked are negative — second only to Hyundai. Data from Digimind shows that viewers also took to social media to air their grievances against the PayPal ad (which parent publication Adweek ranked as one of the worst commercials). Esurance, which announced a popular Twitter contest around the hashtag #EsuranceSweepstakes before the game, was the most-used ad-based hashtag on Twitter, according to Amobee. Amobee counted more than 1.8 million mentions of Esurance, toppling 2nd-best Doritos (317K).